Whether welcoming patrons before a performance, providing the public with information about the Centre, ushering a group of school children to their seats, or performing many other vital tasks, our volunteers give the Centre its personal identity. 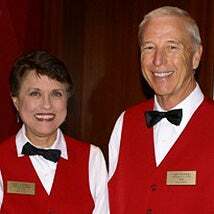 As our most visible hosts and hostesses, their primary goal is to make every experience here enjoyable and memorable for our community. They are given full involvement and participation in Centre activities, meaningful assignments, and recognition for work well done. We know that, without our dedicated and gracious volunteers, the vibrant, warm atmosphere that makes the Centre so special would not be possible. The essential requirements to become a volunteer are an interest and enthusiasm for the performing arts, a willingness to serve all patrons of the Centre with care and respect, a high level of congeniality in serving our guests, a professional demeanor, and punctuality in all assignments. Volunteers must be 16 years of age or older. Volunteers are needed to serve as children’s education program ushers, performance night ushers, and tour docents. It is the individual’s willingness to serve that makes the volunteer program successful. Your acceptance of volunteering indicates an agreement to fulfill the responsibility for active participation and affirms your earnest support of the principles and ideals of Cobb Energy Centre. We would like to hear from any and all in our community who have a strong interest and some time to serve on a volunteer staff for our performing arts facility. Those with previous volunteer experience in this field are especially welcome to apply. We will respond to all who inquire.